“Pressure Cooked Sardines”; you must be wondering about this name, 🙂 . Well, I am not sure, if this recipe has any other name, so I named it this way and it sure is tasty. This Pressure cooker Mathi Curry is such an easy recipe and my mummy used to make it regularly, especially when my cousin Jacky was around. She used to love this curry very much. 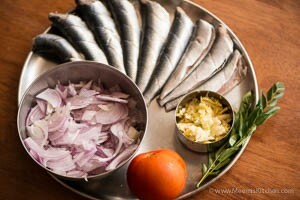 In Kerala, Sardines are popularly known as “Mathi” or “Chala”, and there are a variety of popular sardine dishes, like Matthi Fry, Mathi mulakitta curry, Mathi Peera pattichathu, Naadan Mathi curry, Mathi Pollichathu, Mathi in Cabbage… the mouthwatering list can go on and on. Pressure cooker Mathi curry recipe is another simple, tasty way of preparing Sardines. 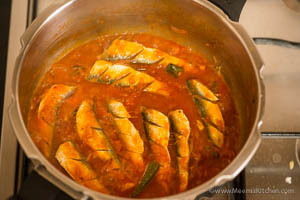 Unlike other popular Kerala fish curries like Alleppey Fish curry, Kottayam Fish curry, Fish Masala or Spicy tangy Fish curry which uses tamarind, this “Pressure cooked sardines” is prepared in an Onion Tomato gravy with vinegar to make it tangier. 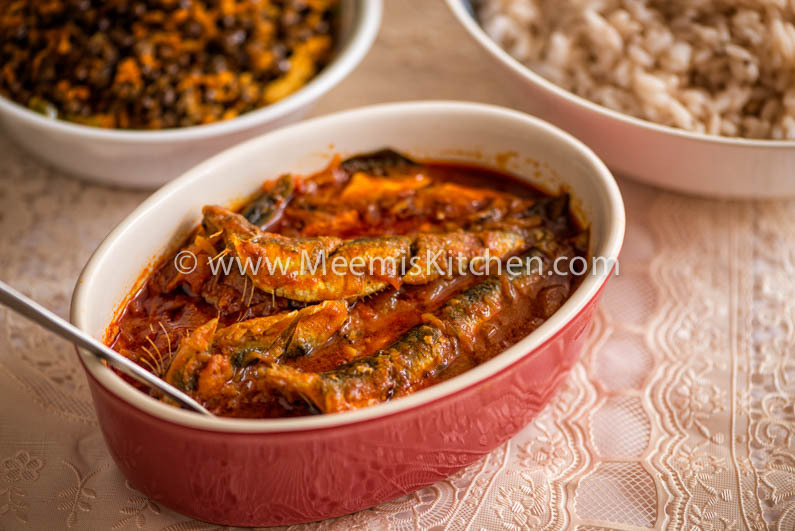 In this recipe, the sardines are pressure cooked and not cooked in Manchatti or kadai. It makes the Sardine soft, and even the bones become soft and you can chew and take in all that calcium!!. Pressure cooker Mathi curry is really delicious and is prepared with very simple ingredients. You should also try my Ayala curry with mangoes, Karimeen Mappas, Karimeen Thilappichathu, Prawns in Coconut milk, Special Fish Molee, Fish Caldine etc.. Sardines are great for your diet like Mackerel. Sardines has abundance of protein, Calcium, vitamins and minerals.It reduces inflammation in the body and protects your bones. Due to its strong smell and taste, people tend to avoid this superfood, but try out ways to include this great food in your diet. Instead of frying (and the smell engulfing the whole house), try this healthy Pressure cooker Mathi curry. For all the Sardine lovers, this would be a great treat! Enjoy!! Green Chilly : 1 no. Clean the Sardines (Mathi) and make three slashes on each side and keep aside. Slice the onions, crush garlic and ginger. 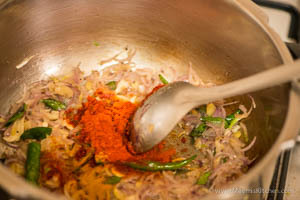 Heat oil in a pressure pan, add the sliced onions and slit green chilly, and curry leaves and sauté for some time till semi limp. Add the crushed garlic and ginger and sauté. Add the chilly Powder and turmeric powder and sauté well. Add chopped tomatoes and sauté again. Add one cup (or little more) water and bring to a boil. Add vinegar and adjust the salt. Add the sardines to the boiling gravy and swirl the Pressure Pan to mix well. Cover and pressure cook till the first whistle. Once the pressure goes, serve hot with rice. It is that simple!! Enjoy!! Please adjust the vinegar and spices as per your spice/ tanginess. Tomatoes should be chopped finely. You can pressure cook it for few more minutes after first whistle to make it softer. Enjoy the Pressure cooked sardines with rice. And do share and let me know if you like it. God Bless! !